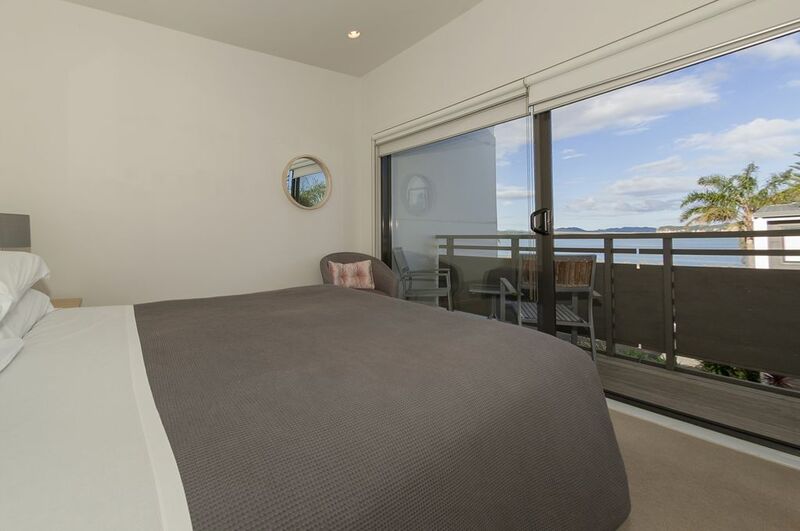 Aqua Soleil Villa 25 is Ideal for your family holiday, this three bedroom villa has views over the Mercury Bay, is fully self contained with all linen and towels provided. Come and enjoy for your next holiday in Mercury Bay, the unspoilt playground of paradise. The Villa has two levels, on the lower level there is an open plan kitchen, dining and living area with a full width ranch slider onto the deck and views of the bay and township. There is outdoor seating for your use. The modern kitchen is well equipped with fridge and freezer, dishwasher, oven, stove and grill, microwave, kettle and toaster, utensils, cutlery and crockery. The lounge has seating for enjoying the view or watching freeview television and there is a dining table. Also on this level is the third bedroom with twin single beds. Off the lounge is a toilet with hand basin. The master bedroom is upstairs with a ranch slider opening up to a full deck along with the second queen bedroom with views over the pool and spa. Also upstairs is the bathroom with toilet, vanity and shower. Aqua Soleil Complex has a lap pool and spa available for your use and is located directly across the road from Brophys beach which is ideal for swimming, walking and exploring the seashore and has beach access for launching trailered vessels. Whitianga township with its shops, supermarket, cafes and restaurants is only a 5 minute drive away or a leisurely 40 minute walk along the beachfront. Enjoy a soak in the hot pools at The Lost Spring, or from the wharf take a ferry ride to Ferry Landing and explore the nearby beaches and bush walks or embark on a scenic cruise of the local area from one of the many local tour operators. Whitianga is an ideal location for exploring the local gems that the area has to offer; walking into Cathedral Cove, adventure activities at High Zone or Combat Zone, diving the local waters, soaking in a hot pool at low tide at Hot Water Beach, There are many places to explore in the Coromandel. Fully furnished and self-contained villa with all linen and towels provided, free WIFI. This is the third time we’ve stayed at Villa 25 and it remains a fantastic place to stay for the whole family. Good base to explore the Coromandel. Jacquie was very easy to deal with. Great place, great location. Love the pool. They need to have fans for all the bedrooms. It got so hot in there. I find it unusual why you can’t use the spa till after 5pm ? The villa was modern and clean, and the pool was a bonus that we got more use out of than expected - handy for the kids to kill half an hour while dinner is being made. Location works - we spent most days at Hahei/Cooks/Kuatunu with friends and Whitianga was nice and central. Villa was moved from original booking so not as well placed. Beds really uncomfortable. Long walk into town. Nice and near the beach. Would have been perfect if the bath toiletries were of larger size. Would have been perfect if the bath toiletries were of larger size. For 6 pax for 2 nights, we had a small tube of hair shampoo and conditioner and a small piece of hand soap.